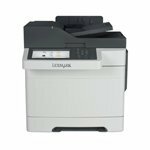 Lexmark CX510de Laser A4.Print/Copy/Scan/Fax, Color, A4, 30 ppm (A4), 1200 x 1200 dpi, 251 Pages In, Gigabit Ethernet, USB, 1024 MB, 7.0" e-Task Touchscreen, LV SPR TAA Fabulous Colour. Fully Loaded The network-ready Lexmark CX510de MFP with a colour touch screen and a print speed as fast as 30 ppm with two-sided printing lets you copy, scan and fax. Freedom to Print on the Fly Produce professional colour in-house, on demand. With 1 GB of memory and a dual-core processor, youâ?TMll print fast, too. Professional Colour Matching Lexmark Named Color Replacement and PANTONEÂ® calibration make it easy to develop a consistent brand image by accurately matching your colours. High Resolution Graphics With up to true 1200 x 1200 dpi resolution, images and graphics stay crisp. Lexmark's Unisonâ"¢ Toner ensures consistent quality, too. Super Fast and Quiet Output Quickly print, copy and scan up to 30 pages per minute in black and colour, plus produce a one-page colour document in as little as 11,5 seconds. Smart Touch Screen and USB Port The vibrant 17,8 cm colour touch screen provides access to easy-to-use pre-installed productivity solutions. Thereâ?TMs a convenient front USB port, too.